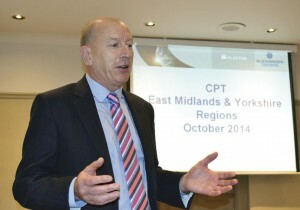 The first of the CPT regional conferences got under way this month, with the East Midlands and Yorkshire regions hosting the inaugural event at the Red Lion Hotel in Todwick, South Yorkshire. Approximately 20 members were in attendance. 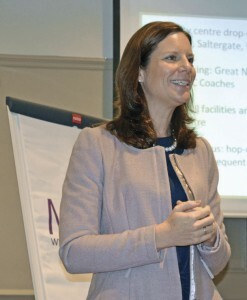 Kirsty Flatt was there to report on the proceedings for Bus & Coach Buyer. 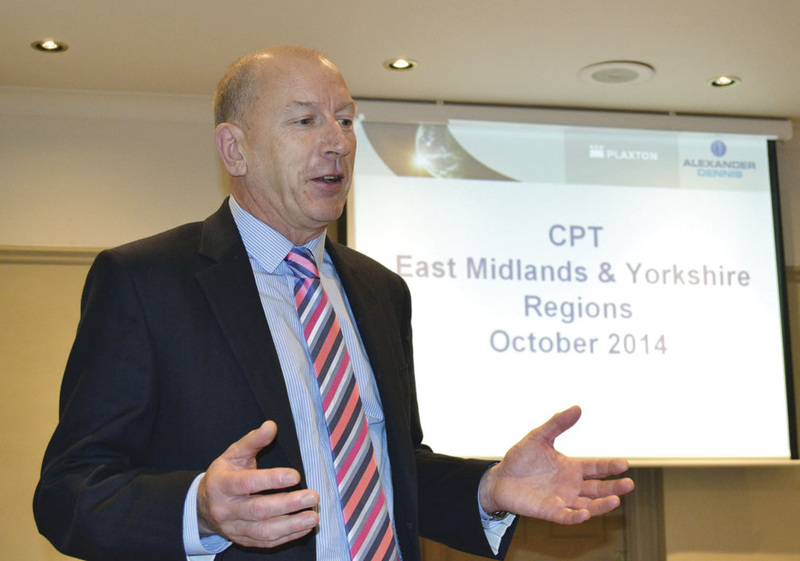 Keith McNally, the CPT’s Regional Manager, hosted and chaired the event and began by thanking the sponsors, Plaxton and The Ashton Group. Kevin Rooney, Traffic Commissioner for the North East of England gave a humorous and interesting presentation. 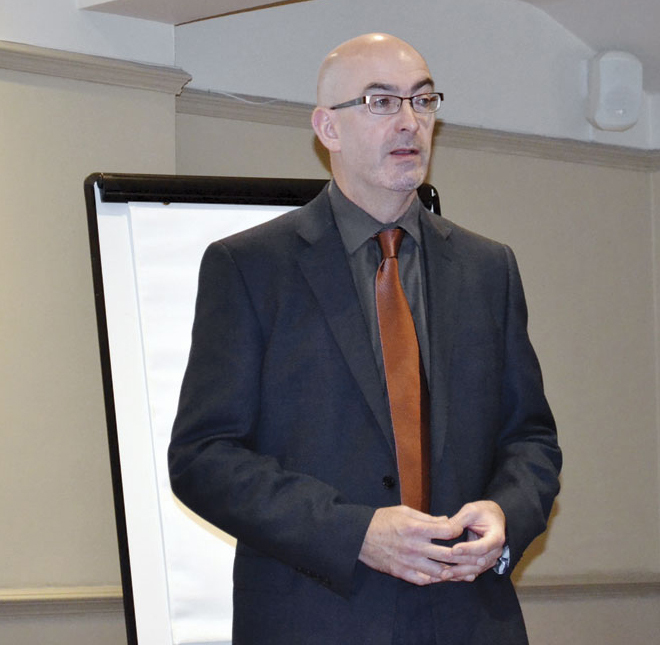 He began by explaining the role of a Traffic Commissioner and gave advice on how to avoid being in front of one at a public inquiry, this included the need to build professionalism within the coaching industry. One of his key focuses was on the new guide to Maintaining Road Worthiness which was introduced in April of this year. The guide gives recommendations regarding daily walk around checks, regular vehicle safety inspections, recording the collected data and roller brake testing, which it suggests should take place three times a year, outside of the annual MOT. Each operator must show that they have the sufficient funds available to prove that they can maintain the business and their vehicles. For both national and international licenses it is £7,400 for the first vehicle and £4,100 thereafter. You will need to show an average over three months, allowing for any recent expenditure. Often, at a public inquiry, the Traffic Commissioner will allow a grace period to get this together. Assets can be sold to meet this financial obligation but it must not be the working fleet or affect the day to day running of the operation. He joked that the owner’s Bentley is often a good place to start! Two pension experts from Gordons LLP, Ruth Bamforth and Craig Looker gave an in-depth presentation and pack on Auto Enrolment and how to be compliant. Employers need to be aware of their responsibilities and plan accordingly as it is recommended that six months planning is required. Every employee will have to be informed of the process and will be given the right to opt-in to the pension scheme. The employer is NOT allowed to encourage staff to opt out and if found to do so, will incur fines. It was suggested that an option for dealing with this was to automatically put everyone in to the scheme and change their contract to reflect this. Salary sacrifice was also discussed and this must not be used as an alternative to the automatic enrolment provisions but may run alongside as an additional scheme. This lead to discussions on the additional cost to businesses to implement such a scheme as they would need to employ an expert to provide a pension and run the scheme, one operator suggested that one company was charging £3k and this was with CPT discount. Of course, this is where the government scheme is deemed the ‘easy option’ but the return on investment is not guaranteed. After such an intense session, Emma Tatlow’s case for Visiting Lincoln should have been a light reprieve but it wasn’t without controversy. Emma is the Partnership Manager for Visit Lincoln and presented their case for Lincoln being a coach friendly city for 2015. Lincoln Castle is currently undergoing a major £22m refurbishment project in readiness for next year’s 800th anniversary of the Magna Carta where one of only four remaining is housed. She went on to discuss other tourism projects that are taking place across the city in advance of inviting operators to partake in a familiarisation trip. The Lincoln Christmas Markets were also discussed and she received a lot of opposition from operator’s who objected to the parking costs of £206 per day and that they were unable to drop off and come back again, despite pre-booking. Although this wasn’t within her remit, she did say that she would pass this information on to the city council for discussion. James Stokes, Business Development Manager for Coach Hire Comparison, the coach booking and quotation website, was there to encourage new operators to subscribe to his service. He skilfully used real examples from an operator who was present, to articulate how the site works. Those wishing to hire a coach can use the website to put in their requirements, specifically destinations and number of passengers. This is then sent out to the subscribed operators within a 30 mile radius. Those wishing to quote then respond and the customer will be able to see testimonials from previous clients and choose the company that best meets their requirements. James’ goal is to be seen as ‘the Tripadvisor of the coach hire market’ and went on to explain the ongoing improvements that are being made to the service. They will be exhibiting at Euro Bus Expo on stand B11 should you wish to learn more. Plaxton were the key sponsor of the event and it wasn’t without a touch of irony that Andy Warrender, who had been the company’s Marketing Manger for many years, was at the event in his brand new role (as of the day before) as Coaching Executive for the CPT. This left Kevin Wood, Business, Development Director to present to us and he started by thanking Andy for his work with Plaxton, before giving an overview of ADL. They are Britain’s biggest supplier of hybrid vehicles with over 700 currently in operation. The product range for both the coach and bus sectors was shown, focussing in particular on the new Cheetah which will be built at Scarborough, the new Euro6 Enviro400 double decker and the Enviro200 MMC midi coach, both of which, along with an electric bus, will be on display on their stand at Euro Bus Expo. Phil Jones began by talking about the need for drivers to heed temporary speed restrictions to protect the safety of the workers. This raised a question from a delegate why speed restrictions were put in place over long stretches where work often wasn’t due to take place for several weeks, sometimes even months. Phil explained that this was the most cost effective, efficient and safest way to implement works. Brian Gash, Senior Project Manager for Smarter Motorways Programme followed by demonstrating how smart motorways work by increasing flow during peak periods using a number of sophisticated monitoring systems. This is already happening on the M1 and work is scheduled for the M6, M5 and M60. As seems to be high on everyone’s agenda, the ultimate plan is to improve the road networks but not at a cost of the air quality. 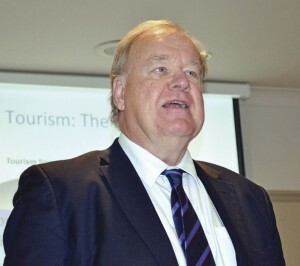 Alf Scrimgour, Operations Tourism Executive for the CPT, gave an interesting presentation based on coach tourism in the UK, based on three surveys, produced by The Daily Mail, Mintel and Visit England. Between 2008-2013, coach tourism fell by 13% but with only a 5% decrease in terms of value. Alf reassured us that coach tourism was still a huge market and that we needed to be aware of the trends and tailor packages accordingly. Most trips are now 5 nights or less with the average stay being 3.3 days. Approximately 20% of all tours are now booked online and Alf emphasised the need for websites to be ‘updated, interesting and different.’ He reiterated that we were wrong to assume that the coach tour market of 60+ weren’t computer literate and that the number of over 60s is forecast to rise by 45% between 2014 and 2034, reaching an estimated 21.7 million. Social Media also had an important part to play with many customers now posting reviews. 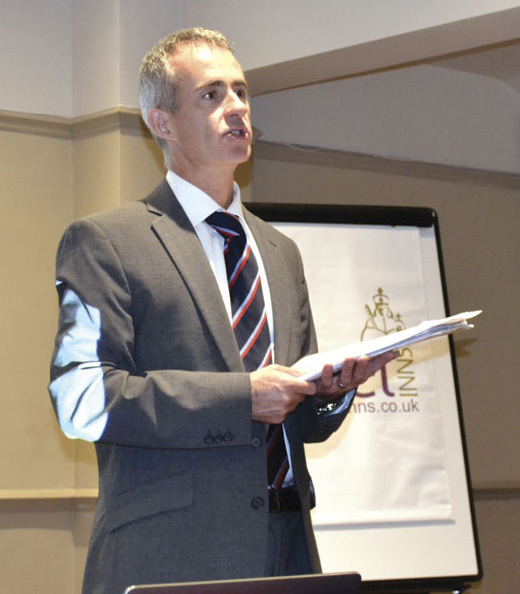 Mike Kenny, MD Mobile Solutions led an interactive demonstration on his paperless, mobile technology which can be used for registering daily vehicle checks, via a subscription smart phone app. The driver completes the checks in the normal way, using his phone, with the advantage of having a camera to instantly record any defects. This then sends an email to the delegated personnel back at the depot who can then act on this information. It is easily customised to suit your fleet and it will alert you if any reports have not been completed. Three ‘volunteers’ were given devices and asked to fill in a report and send the details in. This demonstrated how simple it was to operate and allowed us to see the system working in real time. All the reports are conveniently stored on cloud so there is no concern regarding storage. The final presentation of the day and following the theme of smart technology was from Derek Hart, Senior Sales Manager of Navman, the vehicle tracking application. As well as being a vehicle tracking device there are a number of functions available, depending on which model you choose, these include driver behaviour, navigation, Driver ID, two-way messaging and vehicle check reporting. Operators can conveniently check whether their vehicles are running to schedule and see where they are at any given time either on an office terminal or remotely from a hand-held device. Driver performance can also be recorded so that excessive braking or idling can be monitored and relevant training given to optimise fuel economy. The Navigation shows live traffic flow feeds and gives re-routing options. Fuel stops and congestion black spots are already pre-programmed in and those monitoring from the depot can offer alternative routes through the two way messaging system. The system can also be used for recording daily vehicle checks. Despite over-running, the programme was well thought out with a good mix of product, legislation and coaching but with a regional focus. The general buzz and interaction from the participants was indicative of useful and well received information. I felt that this was an excellent first conference that CPT members would benefit from.